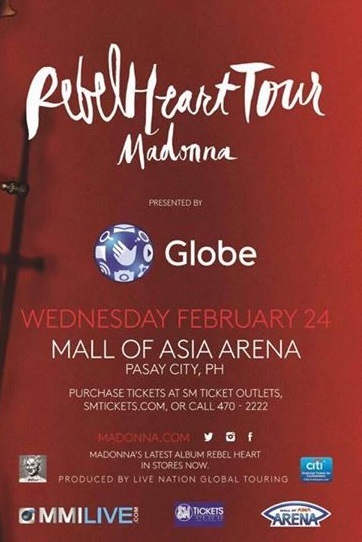 Madonna Live In Manila concert is happening on February 24, 2016. That's a Wednesday, and almost 7 months from now, so you still have enough time to save money and buy "expensive" ticket to the concert. The Madonna "Rebel Heaart Tour" will be taking place at the SM Mall of Asia Arena, and as announced by SM Tickets yesterday afternoon, the tickets for the Madonna Live in Manila concert will be available starting Sunday, July 26, 2015. Are you ready for possibly the biggest concert in the Philippines in 2016? Your mom, your dad and their friends perhaps are the most excited about it. Madonna isn't in my generation, but I'm also familiar with her songs, such as the classic hits "Like A Virgin", "Material Girl", "Crazy For You", "Papa Don't Preach" and even "You Must Love Me, "Don't Cry For Me Argentina" and "American Pie". Ohhh... I wanna watch!